Bring the tropics to your outdoors with the Christopher Knight Home San Marco outdoor 3-piece wicker chaise lounge set. This lounge set features a durable construction that is both weather resistant and UV protected. I did a lot of research before purchasing this set. I wanted to make sure the material would be durable. 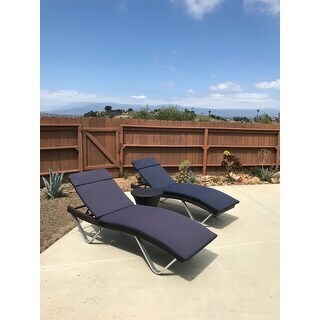 I have purchased similar lounge chairs at other stores that my husband sat on and broke after a month or two in the sun, I used this set all last summer, in Arizona, and they are still in great condition. They lasted through the monsoons and my husband sitting on them. I am now looking for a table and chair set by the same manufacturer. 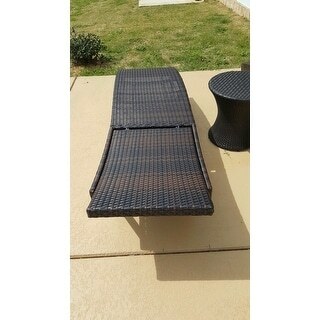 I would recommend this to anyone wanting a great set of loungers for a great price. Christopher Knight Home lounge chairs are very good quality. I've had a set for over two years and the quality was so great that I purchased another set. Set comes unassembled, but not too hard to put together. It is much easier with 2 people assembling, but I put the first one together myself in 44 minutes. The second one with help of my husband took only 25-30 min. Set seems solid. My only disappointment is this set cannot stack and the legs do not fold up like a similar set San Marco with the same legs. My fault, I did not wait or see any replies to my question on overstock before placing the order as I wanted the sale price. I bought the cushions that popped up to go with the set, but they are too wide for this set. Be aware and look at the measurements of cushions that pop up to "complete" the set. I will keep them as my husband destroyed the box they came in. received the 3 piece set promptly and in good condition. Wanted this chaise lounge because it is much higher than most about 18 " compared to usual 12 or 13". Easy to put together and perfect for my family with bad knees. Fantastic compliment to our pool. That’s chaise outdoor chairs and table have made for many long outdoor naps. Though not made in the USA they are made from quality material and stand up against both my kids and dogs. This set looks very nice now that it is put together. Assembly would have been easy if some of the holes weren't covered either partially or completely by the wicker. I had to damage the piece in order to put the screws in. Fortunately, it is on the underside. 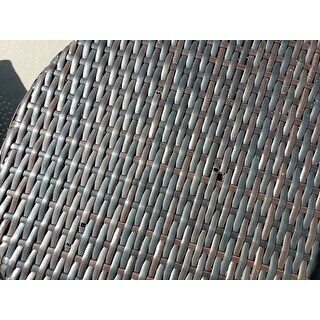 Both of the chaises had issues with the legs lining up with the holes in the base. The assembly should have taken about 20 minutes, but with all the work arounds to get it done, it took about 2 hours. Hopefully they hold up. I ordered 2 last summer. The angle of decline was different on the 2 chaises. One was so "off" that it was impossible to recline and comfortably read. Overstock graciously sent me a replacement. When I lined the 3 chaises up side by side I noticed each one was slightly different from the others - color, angle of decline and back frame design. That aside, the 2 I've kept are comfortable but without a cushion they wouldn't look like a matched pair. We ordered 2 sets. We are so pleased. Easy to assemble, very sturdy and very high quality material. Can’t wait to enjoy them this summer around our pool. Both of the chairs look like cars that have been in an accident and are out of alignment. One does not sit squarely on the ground. I rue the day I ordered these and I feel badly that my husband spent so much time putting them together. Money NOT well spent! I love these lounge chairs! They look so sturdy and comfortable! I can’t wait for the summer to try them. I used the table elsewhere but it’s so beautiful also. I’m very happy with my purchase, the time it took to deliver it and the quality. Assembly was a bit time consuming but easy enough. These chairs are great. They look much more expensive than they were. The only concern I had was in the instructions, it stated to keep out of direct sunlight! Have had them for a full summer and they stood up to the sun well. 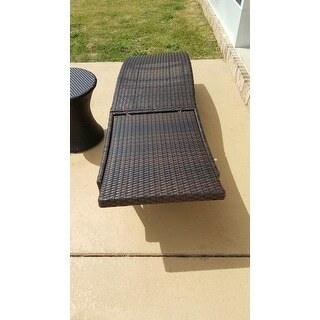 And yes, they are in direct sunlight, right where you would expect chaise lounges to be! Great lounge chairs. We love the sturdiness, the color and the look. They look great by our pool. We had an issue with one of them when putting them together and customer service solved the issue very quick. Quality product and was easy to assemble. Easy to assemble, looks very good, and only had for one season, but so far so good. This set is very nice! Looks great on our patio and very closely matches a separate outdoor set with couch, love seat and chair that we already had. Very comfy and pretty easy to put together. Hubby put 4 chairs together in 45 mins. "Are these chairs comfortable to lay flat on your stomach?" I personally don't think they need cushions, I have had several people use them and have offered the cushions and they declines. However , most seating does feel better with a cushion. However I'd recommend waiting until you get the chaise, because I ordered cushions along with my purchase and even though they fit, they are too wide and hang over the sides. "Do the legs on this fold up for storage? And does the lounge chair fold in had for storage like some of the others in this brand?" Legs DO NOT fold in any way. The back part of the lounge can go all the way back and lay flat, but it does not come all the way forward and lay flat. hipe this helps. This lounge chair doesn't not fold "away"
I asked the question and unfortunately placed the order before any answer was posted. Does not fold and unfortunately won't stack either. Luckily we have a large covered porch to store in the off season. Oh well. 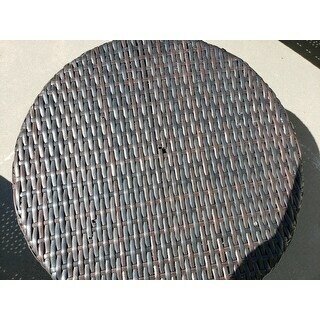 "The description says the table is powder coated aluminum but the chairs are just aluminum, not powder coated. Is that a mistake?" Both items are powder coated. They are a great buy for the price. 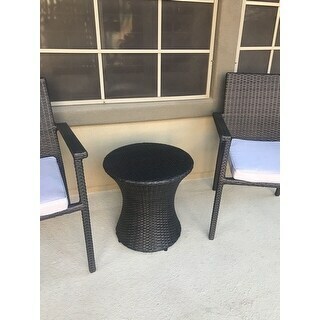 "I live in Arizona, and Sunbrella is the Gold standard for outdoor patio furniture being able to handle the Arizona heat.... Will this Wicker hold up?" This set was made to be used outdoors, so it will weather elements well. "The picture only shows the back up or down. Does it have multiple level adjustments?" Yes, there are about 5 or 6 adjustments. I bought this set...was easy to assemble, did it myself, and I am very happy with them. "I'd like to get these for our beach house. Will they rust if left outside? Thanks for your help!" These have been treated against the elements and you should not have any issues with rusting.